1. If your kidney stones are less than five millimeters in diameter, the odds are you will not require kidney stone removal and the stones will pass without any treatment. If the stone is less than ten millimeters than the odds of removal being required are about fifty percent. 2. Extracorporeal Shock Wave Lithotripsy, or ESWL, is the most common treatment used to remove kidney stones, and this treatment uses shock waves to break up the stones. This method will work on many different types of kidney stones, does not require surgery or invasive measures, and is simple to do. 3. A ureteroscopy can be done for kidney stone removal if the stone has moved into the urinary tract and is blocking the passage of urine. This involves a thin flexible tube that is passed up the urinary tract, where the stone is broken up and removed. 4. A stent may be placed in your urinary tract in some cases for a limited time period, so that the stone fragments can pass faster and easier. 5. Kidney stones in men and women are extremely painful, but most stones do not require more than home treatment and pain control until the stones can pass on their own. 6. In some cases even small stone pieces may need to be removed, due to the profession of the patient or other relevant situations where sudden kidney stones pain may put the public at risk. This includes pilots, mass transit workers, and others who must be focused in their job to protect the public. 7. Kidney stone removal may require traditional surgery in some cases, including extremely large stones that cannot be broken up sufficiently to pass without intervention. 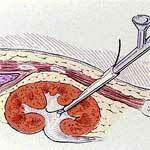 Recovery takes longer when invasive methods are needed to remove kidney stones. 8. Some kidney stone removal procedures can be done under a local anesthetic, but others may require a general anesthesia and this can increase your risks during surgery. Make sure to understand what type of anesthesia will be administered during your procedure. 9. Kidney stones symptoms in women are not always clearly defined, and may be mistaken for other conditions instead. Any persistent pain or medical problems should be evaluated to rule out any serious problems. 10. Kidney stone removal has become much safer and less invasive in most cases, with far lower risks involved. Stone removal is very effective, and can involve recovery times that are quite short.